Since 1997 Dr Dunn's work has focused on the education of surgeons in the US and internationally about the principles and practice of palliative care in the setting of serious and life-limiting illness. Dr Dunn edited The Surgeon and Palliative Care (W.B. Saunders, 2001) and co-edited Surgical Palliative Care ( Oxford, 2004) with the late Alan G. Johnson, MChir, FRCS which have become references for surgeons interested in the field of palliative care. He is Vice Chair of the Surgical Palliative Care Task Force of the American College of Surgeons and was the Editor for the monthly Palliative Care Series in the Journal of the American College of Surgeons. 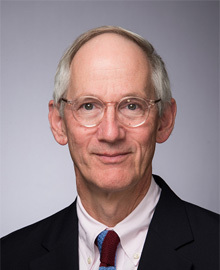 From 2002 to 2008 he served on the Board of Governors of the American College of Surgeons and is the representative of the American Academy of Hospice and Palliative Medicine to the ACS's Commission on Cancer. Dr Dunn was a member of the American Board of Internal Medicine's exam writing committee for the first certification examination for the subspecialty of Hospice and Palliative Medicine. Surgical Palliative Care. In: Current Surgical Therapy. 11th Edition. Cameron J and Cameron A. (Eds). Elsevier, Philadelphia. 2013. Dunn GP (Ed). Update on Surgical Palliative Care. Surgical Clinics of North America. April 2011. Vol. 91. No. 2.